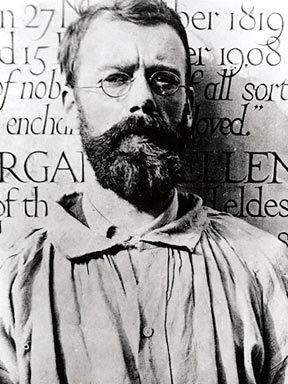 Gill was born in Brighton, the son of non-conformist minister. While apprenticed to an architect in London, he became smitten with the world of calligraphy, which he entered by attending classes given by Edward Johnston. He was profoundly influenced by Johnston's dedicated approach to work and decided to join the world of the Arts and Crafts. During his lifetime he set up three self-sufficient religious communities where, surrounded by his retinue, he worked as sculptor, wood-engraver, and type designer. He also wrote constantly and prodigiously on his favourite topics: social reform; the integration of the body and spirit; the evils of industrialisation; and the importance of the working man. He converted to Catholicism in 1913 and this influenced his sculpture and writings. He designed his first typeface, Perpetua, for Stanley Morison who had badgered him for years on this matter. Of all the 11 typefaces that he designed, Gill Sans is his most famous; it is a clear modern type and became the letter of the railways - appearing on their signs, engine plates, and timetables. Gill described himself on his gravestone as a stone carver. "The shapes of letters do not derive their beauty from any sensual or sentimental reminiscences. No one can say that the O's roundness appeals to us only because it is like that of an apple or of a girl's breast or of the full moon. Letters are things, not pictures of things."